Killer T-lymphocyte attacking a cell. 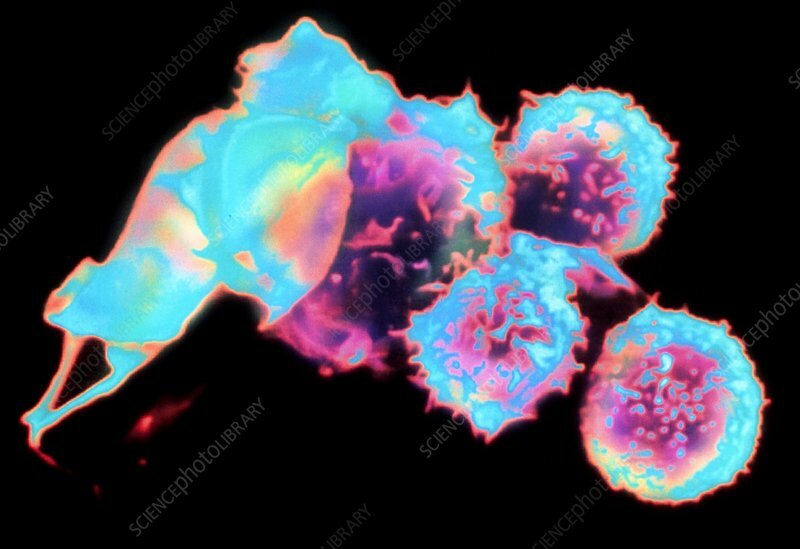 Coloured Scanning Electron Micrograph (SEM) of a T- lymphocyte killer cell attacking a larger cell. Three small rounded killer T-lymphocyte cells, a type of white blood cell, are seen at right. One of these smaller cells (near centre) has attached itself to a large undifferentiated cell (at right) and is attacking it. It recognises the larger cell (which may be a virus infected cell or a cancer cell) by its surface antigens. Once it attaches it will kill the cell, so acting as an important mechanism in the body's immune response. Magnification: unknown.